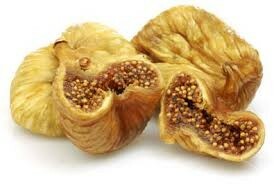 Dried figs are excellent sources of minerals like calcium, copper, potassium, manganese, iron, selenium and zinc. 100 g of dried figs contain 680 mg of potassium, 162 mg of calcium, and 2.03 mg of iron. Potassium is an important component of cell and body fluids that helps controlling heart rate and blood pressure. Copper is required in the production of red blood cells. Iron is required for red blood cell formation as well for cellular oxidation. Dried ones can be added to soup, stews and to enrich poultry, venison, lamb meat. Dry figs are excellent additions to muffins, cakes, sandwiches, pies, and cheesecakes. Organic Certified - Shelf Life minimum 6 month. Available by 250g, 500g and 1kg. Enjoy.